To view 2 more pictures, interactive maps and the full, detailed description of the East Beach community, please Login. 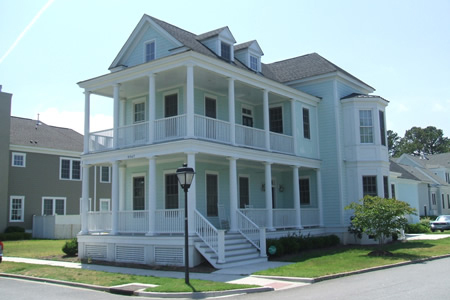 Homes in East Beach offer waterfront properties and homestyle living in this real estate development. Only a few minutes away from Norfolk International Airport, this spot lets residents stay close to it all. Military bases like Naval Station Norfolk and Joint Expeditionary Base Little Creek-Fort Story are nearby and so are some of the area’s best private schools. A comfortable, quality home affords the luxury of a comfortable, quality life and this place can make it happen. These newer homes are not only pleasing to look at and live in, they are long lasting. Built to withstand winds and rain that the Tidewater weather brings, these properties can help homebuyers rest easy. The master planning of this real estate development revolved around the architectural style of the homes. East Beach was designed to reflect the casual elegance that comes from living in the coastal Atlantic regions. Just as one would expect from a bayside real estate development, this community is packed with amenities. One of the most unique perks is that this new construction neighborhood is one of the very few allowed to let golf carts on the street. Residents can access the massive Chesapeake Bay and watch the sun go down with a glass of Pinot Noir. Hang out with neighbors at the Bay Front Club and enjoy croquet, swim in the pool, work out in the fitness room or play tennis. East Beach homeowners can also take advantage of the scenic backdrop for amazing photos. Norfolk is one of the most energetic cities in Hampton Roads. Many area employers are located here and freeways run through this metro area as well. Take the kids to the Virginia Zoo and see animals from all over the world. Explore the extensive media collection at the Mary D. Pretlow Anchor Branch Library. Head out to eat at one of the incredible local restaurants offering a wide variety of fare. To live is good; to live at East Beach is divine. These properties offer the best of surf and turf living on picturesque, tree-lined streets. Newer established neighborhoods don’t always come with real estate featuring such prime views, so come and see what this community is all about. Send me more information about the East Beach new home community.